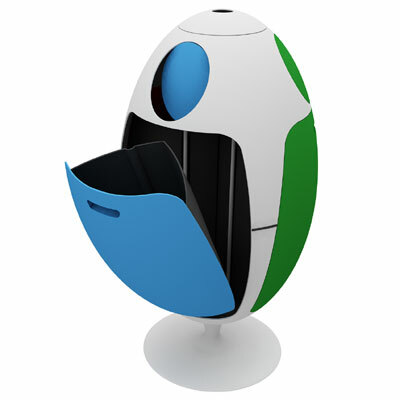 The Ovetto Recycling Bin is a beautiful and stylish way for you to dispose of your household rubbish. The segmented design helps to make recycling simpler, with 3 different sections to take different types of refuse. The Ovetto Recycling Bin has been created by Italian architect Gianluca Soldi. The recycling bin has a sleek curved design that has a modern feel to it, allowing it to fit into any home, school or office easily. The bin spins on its axis allowing you to either place it pride of place in the middle of a room, or to tuck it away into a corner and still have access to all 3 sections quickly and easily. Each of the 3 sections of the bin has a main compartment which opens up to allow for easy bag removal and a small upper circular covered opening for you to post your waste through. There is a central bottle crusher at the top of the bin to allow you to condense the rubbish easily. The Ovetto Recycling Bin seals tightly to prevent any nasty smells leaving the bin. Each section can be lined with bin liners or even left over shopping carrier bags. The brightly coloured sections help you to be able to separate your rubbish into 3 groups quickly and efficiently, different coloured sections are available to allow you to match the door colour with the colour of outdoor recycle bin. The recycling bins are all made from a minimum of 40% recycled plastic themselves, up to a maximum of 70% recycled plastic. The Ovetto Recycling Bin is an aesthetically pleasing way to help section your rubbish to make recycling easier and more fun. The spinning bin allows you easy access to any section whenever needed while being an attractive addition to any kitchen or workplace. The Ovetto Recycling Bin is just £182.60 include shipping.